In this game there will be a grid of 9 x 9 blocks, this grid is further divided into 9 subgroups of 3 x 3 blocks, in addition to that, the blocks will be grouped by red clue lines marked with a number. The object of this game is to fill in all the blocks with 1 - 9 without repeat within either the rows or columns or the subgroups or the clue groups. Moreover, the numbers in a clue group must add up to the number given in the clue. This game is similar to Sudoku but more challenging. 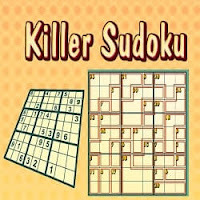 Killer Sudoku is also know as with other name e.g Addoku, Sum Sudoku and in Japan Samunamupure. 1. 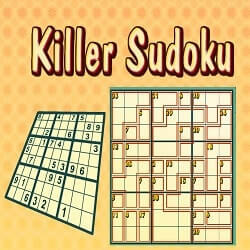 Killer Sudoku Puzzles Main Page: Here are many of the printable Killer Sudoku Puzzles along with very nice Killer Sudoku variations. 2. Daily Online Conceptis Puzzles: Do checkout many different logical puzzles which are updated everyday and you can solve these puzzles online. 3. Mathematical Logical Puzzles for Kids and Teens: If you like solving Killer Sudoku puzzle, then your will love solving these Maths Logic Puzzles. 4. Consecutive Pairs Sudoku Puzzles: It contains another very interesting Sudoku Variation which you will love to solve.